17th century by Ehmedê Xanî’s Mem û Zîn. Reception Hall on Wednesday, 29 June 2016. KurdîLit is a website that aims to bring together and digitally archive basic information regarding actors (writers, translators, publishers, and periodic literary publications) operating in the field of Kurdish literature and publishing. The efforts to make this basic information accessible in three languages aim to establish more solid networks of communication between Kurdish literature producers in Turkey and actors operating in the international literary arena. KurdîLit was planned as a result of collaborations that emerged from conversations on the field of Kurdish literature among Diyarbakır Arts Center, Lîs Editions, and Literature Across Frontiers. This project undertakes to catalog current information and knowledge about Kurdish literature, which stands at a critical juncture of debates over cultural rights and freedom of expression in Turkey. 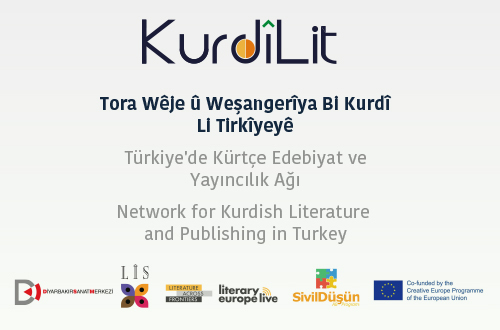 In so doing, KurdîLit aims to improve the visibility of contemporary literature in the Kurmanjî and Kurmanjkî dialects of Kurdish, not only in Turkey but also in the wider region and the international arena; and it aims to foster relationships between contemporary Kurdish literature and European languages and literatures.